When you need to know what you really think, need, or desire, take a cleansing breath and let it out slowly. Place your hand over your heart and ask “What does my Spirit want for me?” and speak the answer aloud. 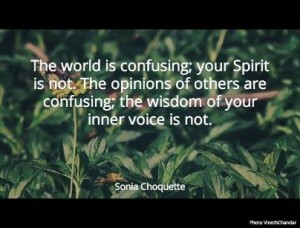 Whatever comes out is your inner voice, your intuition. Trust it, follow its advice. This is your Spirit speaking to you, you can trust it. Interested in receiving weekly Mindful Monday updates by email? Join the mailing list.